In a world of silence comes a breath of fresh air that recounts many of the genre's best moments. After the human race has been wiped clean from the planet, a small unit must survive against the odds as a roving band of creatures use sound to stalk their prey. This unnerving bit of genre goodness is a reflection on the bond of family that begins to falter in the last act. Resting on the strength of John Krasinski and Emily Blunt, we eventually are convinced that the children are the standouts here. A Quiet Place is a rarity in a world that's desperately in need of more mood laced thrillers. 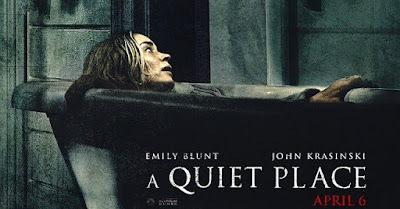 Using an extremely smart marketing campaign that plays right into the arms of its massive awaiting audience, A Quiet Place marks a return to horror that feels both familiar and highly engaging. With a screenplay that never lets up in its amount of tension, many will be reminded of the early days of that Xenomorph franchise, where creatures lurked in the shadows stalking and destroying their human prey. Much like that formative work of Ridley Scott, this original piece of fiction uses our emotions and an even keeled pacing to deliver one of the better horror films of 2018 so far, but also a tribute of sorts that definitely pays respects to many of its predecessors. 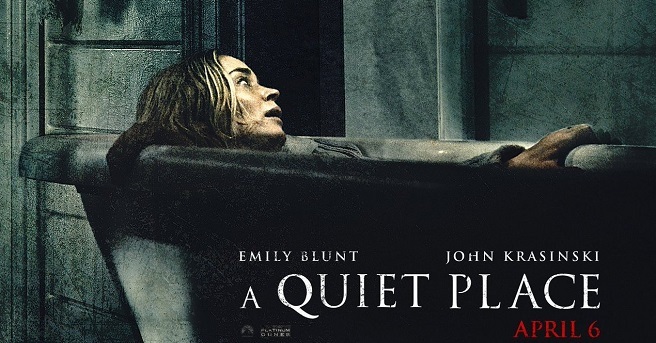 A Quiet Place has markings of Jaws, Signs, Alien, and various other films that play against our fears. Little boy, I told you to shut the f@#$ up!!! No more cookies for you. Perhaps the standout here is the great performances from all involved. Acting in near total silence for an entire ninety minute film couldn't have been easy for any of the actors. Where dramatic portrayals typically rely on convincing dialogue, A Quiet Place offers an alternate mode for its stars. Using physicality, eye contact, and a realistic looking bond between the family members, the movie coordinates and executes a natural feel that's highlighted by excellent visuals, great audio design, and monster effects. There are obvious traits that have been lifted from various cinematic motifs, but it all feels relatively new considering that this is a rare movie that exists with very little spoken communication between characters. Only ambient sound and the musical score set the pitch for what happens on screen. While it's far from perfect, A Quiet Place is the kind of offering that's needed right now. With other thrillers like the amazing Unsane also helping to redefine the landscape of modern horror, this project at least tries to spin things on their head. Instead of going full hardline with overdone gore or too many CGI shots, our beloved hunter of humans exists mainly in the shadows with a few distinct moments specified for it to appear. Again, it looks like a total nod to Alien, but that's okay. Sometimes love for the movies that inspire us can transition to the screen, especially when it completely fits like this does. Mommy just wanted bath time. But nooo. These monsters keep bothering me. Wahhh. 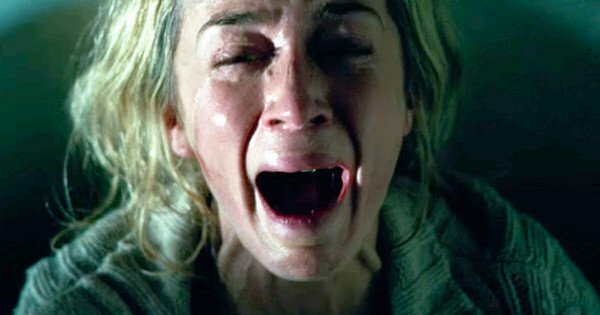 Some are going to discount A Quiet Place. It's no perfect specimen. But, it's at least a visual feast that brings us back to simpler times when nightmares made their way to the screen without being part of a mega franchise. This needs no sequel. Leave this as a stand alone and in time it will get due respect.